MAC morange: here. one of my favourite amplified lipsticks ever. it looks nice straight from the tube or patted in so it’s not as bright. MAC so chaud: here. i think this is like a deeper, matte version of morange and i love it just as much. makes an amazing statement lip. MAC vegas volt: here. one of the first MAC lipsticks i bought and i still like wearing it. 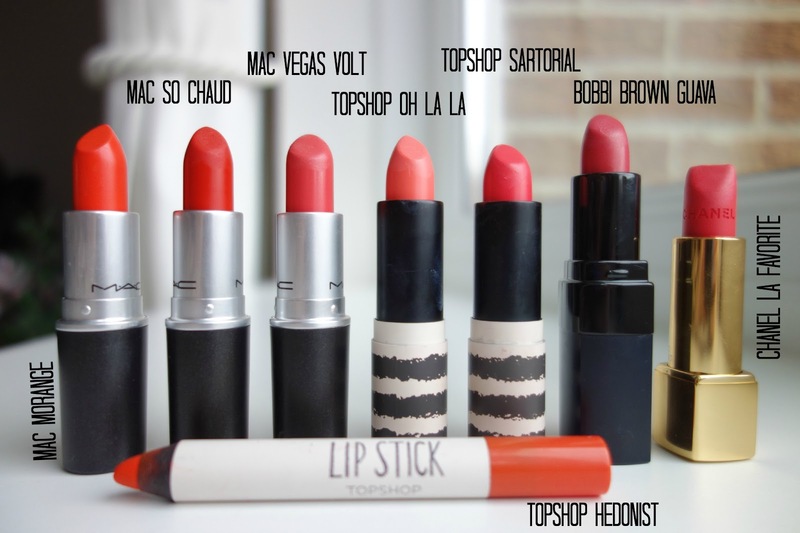 it’s a great ‘introduction’ lippy if you’re after a coral shade. topshop oh la la: here. 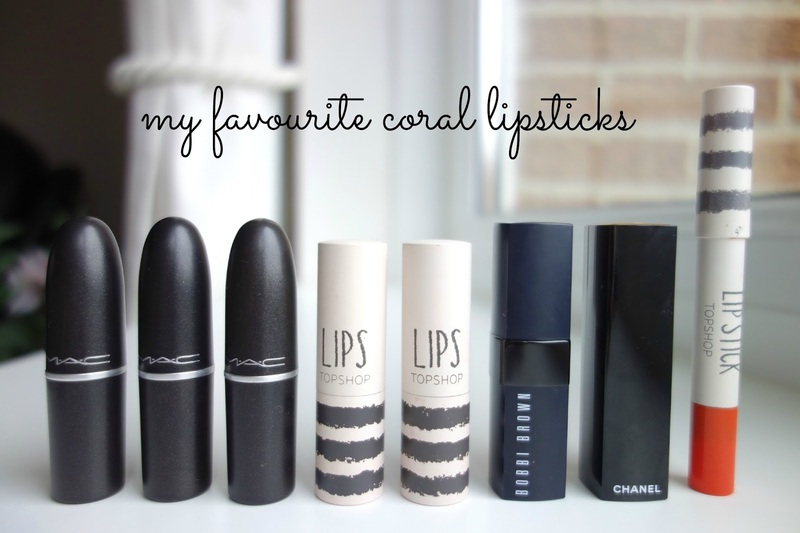 i love topshop lipsticks and lip crayons, they’re amazingly pigmented and long lasting for the price. oh la la looks so gorgeous on and is about as light as i’ll go for these kinda tones! topshop sartorial: a bright, not quite neon, coral shade which is so flattering. i always put it on when i need cheering up! though i’m currently super sad right now as i can’t find it anywhere! wah wah wahhh. bobbi brown guava: here. this is my first bobbi brown lipstick and the formulation is really lovely. smooth and moisturising, i’ll definitely be picking some more up! chanel la favorite: here. cannot believe i squished the top of this after only one use! sigh. this shade is part of their S/S collection, but is apparently being made permanent. it’s a gorgeous shade to wear and compliments lighter outfits so well. topshop hedonist: a very bold orange, but it looks beautiful on! even if you think it’s a little bright for you, go and swatch it instore, you’ll be surprised how flattering it is. 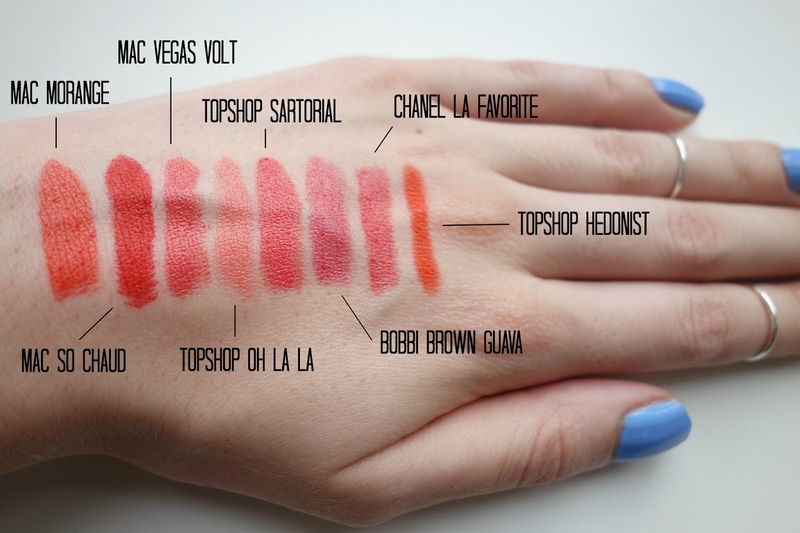 what is your favourite coral shade? any recommendations for me?